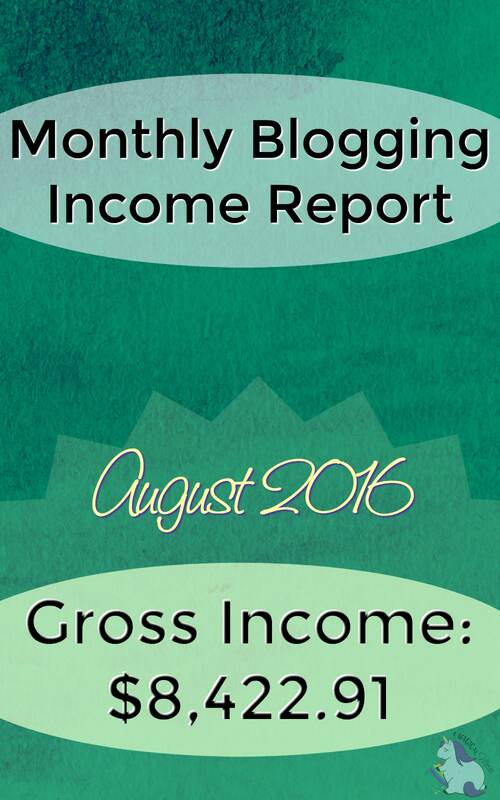 It’s time for August’s blog income report, and I must say I am scratching my head a bit. I was sweating bullets about the expenses for this month due to the rebrand. It turns out, they weren’t as bad as I thought. I am anxious to see September now since some of the expenses must have crossed over. We also collected a helluva lot more than I realized. As always, I am a month behind on my income reports. This is so I can get all of the paperwork and balance the books before pulling all the figures. This report helps me tremendously, so I want it to be completely accurate. Due to the awesome feedback from all of you, I will continue to share my reports publicly. Tapinfluence: $1,085.00 – Some of this is from social posts. Wolf Best Buy: $250.00 – Paid in gift cards. Pajama Affiliates: $49.50 – Someone made the wise decision to buy their affiliate course. The Blogger Network: $182.56. This is probably the last month for them since I switched to Mediavine for ads. Marfeel: $81.70 – Mobile ads. JustSweep.com: $225.00 – My giveaway directory site. Shelley’s Income: $1,650.00 – What Shelley made through the blog on her own. Walking on Sunshine who submits to recipe and DIY linkups: $90.00 – Please use Jennifer Soltys as a referral if you sign up. Lois is awesome. The Hungry Jpeg: $9.00 – Fonts and graphics. Mailchimp: $50.00 – Newsletter. Last month because I switched to ConvertKit. ConvertKit: $29.00 – New newsletter. ManageFlitter: $24.00 – Manage Twitter followers. Facebook Boosts: $8.39 – I don’t know which ad is lingering out there. I didn’t think I had any active Facebook ads. RocketGenius: $99.00 – Gravity Forms renewal. Shelley: $795.29 – What I paid my sister directly. StudioPress: $93.67 – I think we purchased three new themes during the rebrand. Tweet Archivist: $14.99 – Hashtag tracking for a twitter party I hosted. They refunded me and then charged back. I have to investigate. Tweet Binder: $20.74 – Hashtag tracking for the same twitter party. WP Site care: $375.00 – Charge for combining two sites and renaming Sweep Tight to A Magical Mess. I added Shelley’s income like last month. The income total includes what the blog made as a whole. Subtract Shelley’s direct income and it’s $4,894.22. Last month I said the remainder was what I made personally, but that’s not entirely true. That money stays in the business bank account. What I can realistically withdraw for myself is not the same number. This month was a nice jump in income from the previous months. Every year I freak out around the same time of the year. It’s quite cyclical, actually. The beginning of the year is slow; then there’s a little jump, then the summer slows, then the fourth quarter booms. Squirrel-like behavior is necessary, and I am still trying to master that. Times like the fourth quarter, I should hoard as much money as possible in the bank account. If only it were that easy, right? We also need to get our household bills under control. My blog income is not extra money for me. It’s my full-time income which is required to help pay our household bills. When I look at this report, it feels like I should have more money. LOL Seriously, feels like running on a hamster wheel each month. But, self-awareness is key. Now that I have the numbers in my face, I can see where to trim the fat a bit. Cutting blog expenses plus some home expenses will level things out a bit to get to a financial comfort zone. Wow! I’ve never heard of a blogger disclosing how much they made each month. This seems unethical to me. But, if it makes you feel good to share, go ahead. You still do Twitter parties? I thought Twitter put a stop to those years ago. I used to host, co-host and participate as an influencer for Twitter parties, but I thought they were against Twitter’s policies. I used to make pretty close to the same as you, but I’m finding it harder and harder to land sponsored content now. Brands just don’t have the money they used to, to spend on blogs. In the past couple of years I’ve seen my income drop significantly. Glad to see that some bloggers are still bringing in some good income. Congratulations! Why would it be unethical? I read many income reports posted by bloggers and always find them inspiring. That’s one of the reasons I choose to post them myself. It also helps other bloggers see how they can diversify their income. I have had a lot of positive feedback, which is why I continue to post each month. Yes, I still do twitter parties, but not as many as I used to. The ones I do come with official rules written by a legal team that I am confident know what’s allowed on social media. Awe!! Thank you Holley!! I have to thank you for teaching me so much, too. Collaborating with bloggers like you is the best path toward success. I wish I could make money like this. I have only cleared about 200.00 this entire year if i don’t’ count twitter party wins.